Come cruise aboard one of Orange Beach’s Scenic and Nature Cruises, on the America II, to enjoy the pristine waters of the Alabama Gulf Coast’s most beautiful beaches and experience up close viewing of dolphins, seabirds, stingray, rarely sea turtles, and a variety of other marine life. Please keep in mind that we are observing wild animals in their natural habitats, so it is impossible that we can guarantee that you will see any one animal located within our area. However, we do have an authentic style riverboat with two levels for observation. We are a locally owned and operated marina, and offer a personal touch that can only be found in family owned businesses. Our location is at 4575 South Wilson Blvd. Orange Beach, AL 36561. 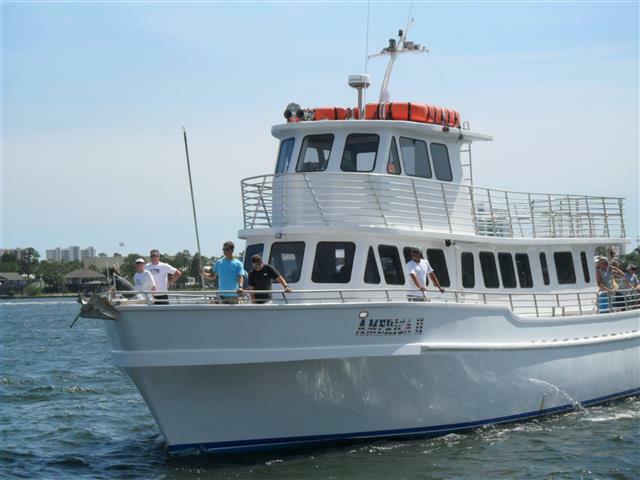 The America II is a large 65 foot double decker USCG approved boat, fully equipped with a climate controlled cabin, two clean restrooms, and plenty of walking space around the exterior of the boat. Seating is also provided all around the upper deck, as well as in the air-conditioned cabin. As America II embarks on a fun-filled cruise in search of the beloved Bottlenose Dolphin, you will experience the beauty and grace of these incredible marine mammals as well as the scenic beauty of their natural environment. When dolphins are spotted, the Captain will announce their location, and the crew will begin to clap and cheer to encourage the dolphins. You are also encouraged to participate in this act to assist in achieving their attention, while watching them swim, play, and surf the waves. The Captain will also educate you on the dolphins, giving you information about the species, their habits and behaviors. Your Captain will enlighten your imagination with an education and knowledge of the dolphins. Around the islands in the Pass is where several natural bird nests inhabit, which gives us an excellent location for seeing various species, including Osprey, Blue Heron, and of course SeaGulls. When the waters are clear, it is also possible to see stingray and sea turtles in the area. Sea turtles are the most difficult to spot since they dive almost immediately after surfacing for air. In addition to cruising around for the wildlife, the boat also tours Ono Island. This island is known for high-priced houses which are not viewable by car, so we take advantage of observing them from the water. Remember when you were a kid, and you got to do something so exciting that you couldn't wait to run home and tell your friends? 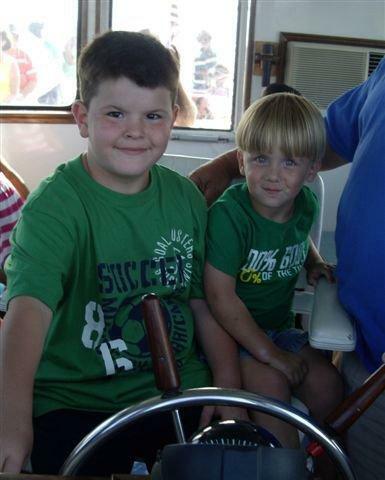 That's what your child can experience on the Southern Belle dolphin and nature cruise in Orange Beach and Gulf Shores area! On our way back to port, children of all ages have an opportunity to become Junior Captains aboard Southern Belle, when they are called to the wheelhouse. Your Junior Captain will get to have their picture taken with the Captain and create a memory that he or she will cherish for years to come. We are the only large vessel in Orange Beach Cruises that offers children the opportunity to help the Captain navigate the ship back to port! As soon as you check in for your scenic and nature cruise, you will be greeted with a smile by our friendly crew, and relaxing family atmosphere. Enjoy our shady tiki hut while you wait to board our ship, and enjoy island music as the boat is boarded while the Captain and crew prepare for departure. We hope that you will find our vessel clean, comfortable, and inviting. Your Captain will brief all guest on safety procedures aboard the ship as the cruise sets sail for your adventure. A rather stout, short-beaked (seldom more than 75 mm long) dolphin with sloping forehead and projecting lower jaw; dorsal fin high, falcate, and situated about midway from snout to flukes; pectoral fin broad at base, obtusely rounded at tip; upperparts plumbeous gray, more or less tinged with purplish, becoming black soon after death; sides pale gray, belly white; teeth 23/23, large, nearly round in cross section in adults, and conical; height above jawbone, 12-17 mm, diameter, 5-9 mm. Total length of adults may reach 3.5 m. A subadult male measured: total length, 2.9 m; length of mouth, 319 mm; tip of snout to dorsal fin, 1,275 mm; length of pectoral fin, 395 mm; vertical height of dorsal fin, 229 mm; breadth of flukes, 612 mm. Bottlenose dolphins are distributed worldwide in tropical and temperate waters. In the western North Atlantic, these dolphins occur as far north as Nova Scotia but are most common in coastal waters from New England to Florida, the Gulf of Mexico, the Caribbean, and south to Venezuela. This is the most common cetacean of the Gulf of Mexico, along the Alabama Gulf coast, and in the bays around Orange Beach and Gulf Shores. The Bottlenose Dolphin is grey, varying from dark grey at the top near the dorsal fin to very light grey and almost white or maybe even a pinkish color at the underside. This makes it harder to see both from above and below when swimming. The elongated upper and lower jaws form what is called the rostrum, which gives the animal the name bottlenose. However, the actual nose of the dolphin is the blowhoe on top of its head. The friendly nature of the dolphin is in large part due to the characteristic "smile" on its face. Yet, this smile does not mean that it is happy; it is unable to move its jaw to any other position. The dorsal fin is formed of dense tissue and does not contain bones or muscle. The animal propels itself forward by moving the flukes (or tail) up and down. Flippers, located at the sides of the body, are for steering. Bottlenose dolphins may be seen in groups numbering up to several hundred but smaller social units of two to 15 are more common. Group size is affected by habitat structure and tends to increase with water depth. Group members interact closely and are highly cooperative in feeding, protective, and nursery activities. These dolphins make numerous sounds and are probably both good with echolocation and highly communicative. Bottlenose dolphins eat a wide variety of food items depending on what is available and abundant at a given time. Dolphins in the Orange Beach and Gulf Shores area typically eat speckled trout, pike, rays, mullet, and catfish. They are also known to eat anchovies, menhaden, minnows, shrimp, and eel. They eat about 18-36 kg of fish each day. Commonly observed feeding behaviors include foraging around shrimp boats, either working or not, to feed on fish attracted to the boats. The dolphins also eat "bycatch" dumped from working trawlers. Groups of these dolphins have been observed cooperating in prey capture, with several dolphins herding fish into tight schools that are more easily exploited. Bottlenoses are also known to chase prey into very shallow water and may lunge onto mud banks and shoals in pursuit of panicked fish. Bottlenose dolphins are the most widespread and common cetacean of the coastal Gulf of Mexico and are commonly seen in bays, estuaries, and ship channels. Two distinct forms may occur in the Gulf. These are inshore animals that inhabit shallow lagoons, bays, and inlets and oceanic, or offshore, populations that remain in deeper, offshore waters. Interaction between the two populations is thought to be minimal. Every five to eight minutes, the Bottlenose Dolphin, like all other dolphins, need to rise to the surface to breathe, though it generally breathes more frequently. Normally, dolphins live in groups called pods, usually containing up to 12 animals. These groups are long-term social units and are typically made up of adult females and their young. Several of these pods can join together to form larger groups of one hundred dolphins or more. Males live mostly alone or in groups of two or three and only join pods for short periods of time. Their diet consists mainly of small fish, occasionally also squid, crabs, shrimp, and other smaller animals. Their cone-like teeth serve to grasp but not to chew food. When a shoal of fish has been found, the animals work as a team to keep the fish close together and maximize the harvest. They also search for fish alone, often bottom dwelling species. Sometimes they will employ 'fish wacking' whereby a fish is stunned with the fluke to make catching and eating the fish easier. Print off this coupon or show it to us on a Smart Phone!